> Grade: You can view the grade book and the grading methods. > Questions Bank: You can create questions used on Moodle quizzes. > Categories: Similar to a folder on a desktop of your computer. Questions are stored in each Category. > Import: Import a question from an existing file. > Export: Here questions can be exported into word format. > Users: View all of the users of the course. > Courses: View all of your current courses. > Grades: View the gradebook for your course. 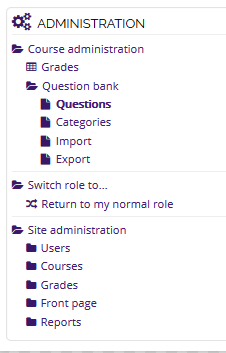 > Front Page: View what the course instructor has on the front page of the administration block.